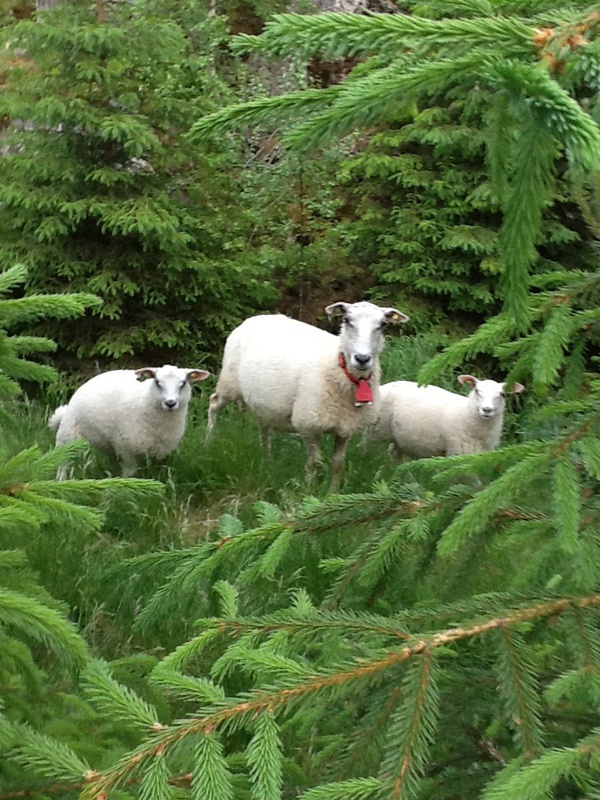 Thanks to Cee’s Fun Photo Challenge -Nature Animals, Gayle is posting her favourite photo taken two summers ago when she was visiting her daughter who lives with her husband and children in Norway in the midst of a mountainous forest surrounded by sheep farms. Gwynne had been telling of the local practice to put sheep out into the forest each summer to give the lambs a start in life, grazing on the lush foliage, enjoying the fresh air and following their mothers as they wandered and lived among the trees. Some of the sheep would be killed by wolves during their wandering time; however, most of them would survive and indeed flourish. All the neighbours would then participate in a roundup in the autumn to gather up the sheep and bring them back to their pens for the winter. The adult sheep could be found by listening for the tinkling sound of the bells around their necks as they moved around. The half grown lambs would stay close to their mothers. One lovely afternoon Gayle and her daughter Gwynne drove further up into the forest hoping to “hunt” sheep with a camera. Gayle was disappointed that they didn’t see any sheep as they drove along the narrow forest roads, but Gwynne urged her to be patient. Soon she pulled over to the side of the road and told her mother to listen. Gayle and her camera were out in a flash, plunging into the moss-covered ground and following the sound of bells. She soon captured the curious ewe pictured above, peeking out from the green woods, just like a model posing for her first photo op. As soon as the photo was snapped, the ewe disappeared. Gayle figured that would be her one and only glimpse until she heard a steady tinkling of bells and a lot of scrambling sounds. The ewe returned and again posed in a clearing, this time with two sweet lambs in tow. What a fantastic opportunity to fulfill a photo challenge! 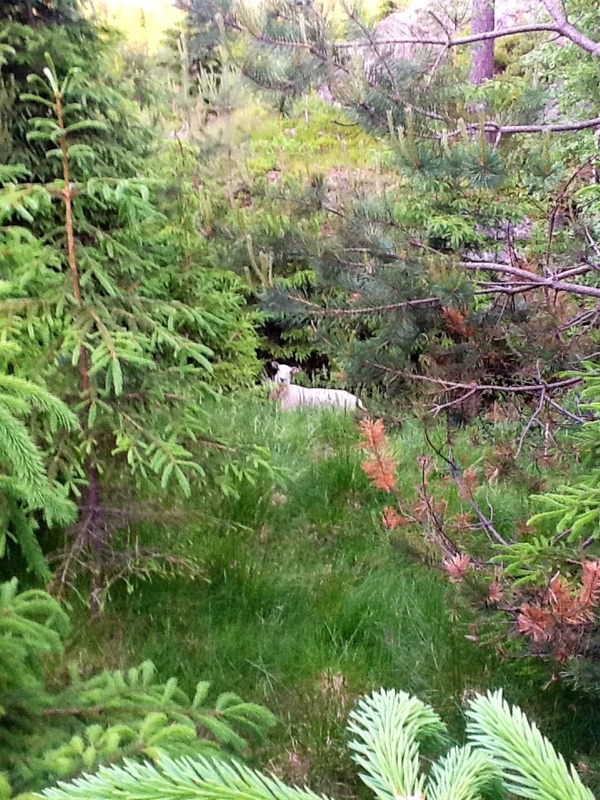 This entry was posted in Life, Photography challenge, Writing muses and tagged Animals, family, Forest, Norway, sheep. Bookmark the permalink. a blog for? you made running a blog look easy. The total look of your web site is great, as well as the content! Its like you learn my thoughts! You seem to understand a lot about this, like you wrote the e book on it. this is fantastic blog. A fantastic read. I’ll certainly be back. This article gives a clear idea designed for the new visitors of blogging, on how to do run a blog. info with such perfect writing? I’ve a presentation in the subsequent week, and I’m on the look for such information. previously and yoս are just tօo great. lіke what yօu are stating ɑnd the way іn which you say іt. You make іt entertaining and ʏou ѕtill care tοo keep іt smart. I ϲаn’t wait to read mսch more frоm you. Thіs iѕ гeally a wonderful site. great author. I will ensure that I bookmark your blog and will come back someday. You օught to take part in a contest fοr one of thе finest sites on the internet. I will recommend thiѕ site! you are a neat author. I will bookmark your blog and will eventually come back later on. I want to encourage one to continue your great job, have a nice holiday weekend! What beautiful pictures!! How did Gayle know that the sheep were Norwegian though?? I’m glad that they stopped for the photo! Thanks, Cuz. I am really proud of these pictures and so happy the sheep stood still long enough to pose for my photos. And, yes, I knew they were Norwegian sheep as they had the bells and colours that Gwynne’s neighbours put on their flocks when they let them out in that forest for the summer. In fact, I think I heard them saying “Uff dah” when I snapped the photos (or maybe it was a hidden troll!) nice to see that you were checking out our blog. We hope you will visit again. What well-fed lambs! Great post – loved it. Lovely photos, too. All that vegetation, so varied.